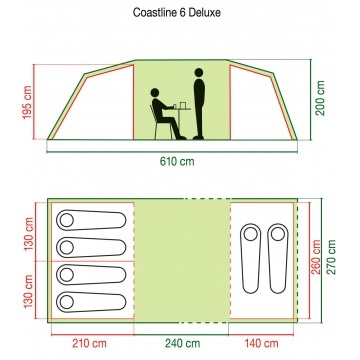 The Coleman Coastline 6 Person Deluxe Family tent features a stable and wind-strong tunnel which can withstand even the toughest of weather conditions, allowing safety for your family throughout your holiday. 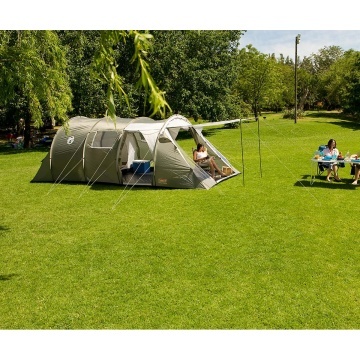 This spacious 6 person tent also contains a sewn groundsheet, keeping the insect free. Seek shelter from the rain with peak protection over the door which allows you to unzip your tent and remain dry. 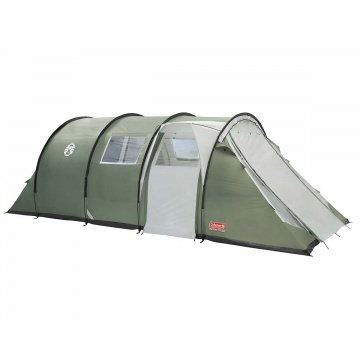 Inside this tent are self-rolling window covers fitted on the large PVC windows allowing for immediate access to the outside world. 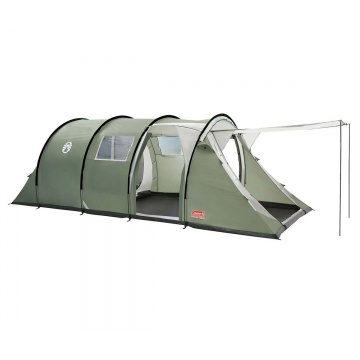 The cool airport provides the option of additional ventilation, critical when camping in warmer conditions. Packed L 70 x W 31 x H 31 cm. Erected L 610 x W 270 x H 200 cm.